The shoe was very comfortable right out of the box, a reviewer claimed. A few buyers enjoyed the design of the Levitate 2. Some runners approved the addition of the Achilles protector in the Levitate 2. The midsole was responsive, and it provided great cushioning, a wearer noted. The padded tongue was well appreciated by various consumers. Many users were pleased that the shoe ran true to size. The upper gave a sock-like fit, according to a pleased buyer. The Levitate 2 was surprisingly nimble and flexible, said an impressed runner. Most of the users of the Levitate 2 claimed the shoe had a roomy toe box. The shoe helped keep the foot in proper alignment, a reviewer reported. Some runners thought the Levitate 2 was a bit heavy. The foot felt quite hot inside the shoe, a user observed. Another person complained that it felt like wearing a sweater in the summer. The shoe took a long time to dry out whenever it got wet or soaked with sweat, a buyer noticed. 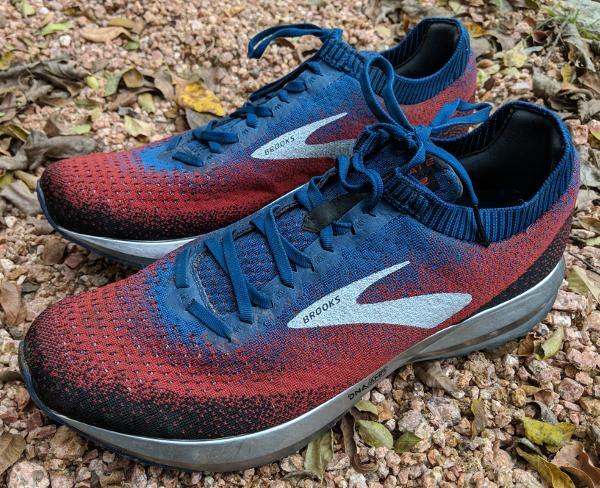 Many users of the Brooks Levitate 2 were impressed with the shoe – numerous praises were made regarding the noticeable improvements, while the fit and performance of the shoe were consistently well-regarded. Although there were some criticisms about the Levitate 2’s weight and in-shoe environment, the majority still concluded that this neutral running shoe was a worthy purchase. I was not looking forward to writing this review. I’m such a Brooks fanboy that it’s hard to criticize them for anything. It is truly remarkable as a runner to have a company as big as Brooks that focuses solely on running shoes. I have been lucky in my running career to run in so many different models of Brooks shoes. Just recently, in fact, I finished up a review of the high stability shoe Brooks Bedlam. Just take a glance at that review to witness fan-boy gushing in action. That being said, a few months ago, I finally found a Brooks shoe that I did not enjoy running in. That shoe was the Brooks Levitate. I was shocked. I reasoned that certainly this was an effort by Brooks to try out something new and different, and the Levitate was the result of an idea that was not executed well. After all, the Levitate was the first Brooks shoe to utilize the newly developed DNA AMP midsole material. The DNA AMP material was supposed to provide “limitless energy” and lead to an effortless ride. As I previously mentioned, this was better in concept than in execution. Simply put, the shoe was clunky, and the energy return was negligible. No big deal though, this was a new endeavor for Brooks and I chalked the misfire up to an underdeveloped concept. Perhaps Brooks was still working out how best to use the AMP material. And so, I find myself daring to hope that Brooks learned from these misfires and has found a way to best utilize its DNA AMP material in the Levitate 2. I just finished a review for the Brooks Bedlam, a shoe that has seemingly cracked the code on how to use the DNA AMP, so I was optimistic when I first laced up the Levitate 2. Regardless, the Levitate line is a different beast, with a different running experience it sets out to deliver. So, has the Levitate 2 improved on the flagship model? Let’s find out! In terms of comfort, I want to start with what I liked about the shoe; the upper. There was nothing wrong with the upper of the Levitate 1. In fact, it was my favorite part of the entire shoe. Thankfully, Brooks has essentially constructed the exact same upper for the Levitate 2. The Flyknit upper offers breathability, durability, and comfort. It isn’t flimsy or thin, and it is substantial enough to provide some structure to the foot as well, holding your foot in place and adding to a secure fit. The tongue is thick and plush. Really, the only difference is the addition of a heel collar. I was initially worried that the collar would rub uncomfortably against my heel, but the collar was barely noticeable and caused no unnecessary friction. Unfortunately, the midsole is a different story. In terms of the comfort provided by the midsole, the Levitate offers different levels of comfort at different speeds. At walking pace, the midsole of the shoe feels fine. It’s nothing exceptional or revolutionary, but at walking speeds, it doesn’t really have to be. It isn’t until you pick up the pace that you notice how rigid the midsole of the shoe actually is and the effects of impact start to take their toll. In both Levitate models, I find that the sweet spot to be a quick 3-mile run. The shoes are fast and responsive and certainly added to my speed, and depending on the day, my body was usually able to tolerate 25min of aggressive running before I started to really feel the impact. At around 3 miles, however, I started to feel the effects of impact on my feet, legs, and back. The Levitate 2 is a shoe that is seemingly ambivalent when it comes to impact reduction. Comfort and a plush ride aren’t the only things sacrificed at the altar of energy return, but they are the most noticeable. In my opinion, the shoe is at its best when used at faster speeds for shorter periods of time. The midsole of the Levitate 2 is a polyurethane foam that is wrapped in a traditional TPU midsole to avoid compression and offer maximum energy return. The idea being that energy lost in the compression of the midsole can be minimized this way and returned to the runner. I have to commend Brooks once again for their ambition here and their commitment to energy return. Furthermore, I can tell that Brooks is really trying to find that perfect balance between stringent firmness and mushy softness while providing said energy return, even though the shoe is a little firmer than I would like. To its credit, the Levitate is snappy, with the added rigidity and firmness of the midsole adding to a quick ride. At really quick speeds, I can almost sense the springiness in the midsole. The sense of speed is also aided by the 8mm drop. I enjoyed the Levitate most when I was running sprints or any other activity that favored speed over distance. Unfortunately, I’ve got to say that in general, I am no fan of how they are using DNA Amp material in this shoe. This is a shame as Brooks had just recently proven to me that they were more than capable of utilizing this material effectively in the Brooks Bedlam. The same can’t be said here. The midsole on this shoe feels clunky and rigid. Furthermore, it feels like it’s just sitting there. With most shoes, I can feel the midsole hard at work and discern the benefits. With the Levitate, these benefits just aren’t pronounced enough for me to notice them. It feels like there’s just a chunk of material underfoot because that’s what shoes are supposed to have there. The sheer amount of midsole present in the Levitate only adds to the clunky feeling. Once again, this would be forgivable if the midsole offered a little more comfort. Complicating things even further is the weight of the shoe. No surprise here, with an extra liberal amount of midsole, comes added weight. With my size 14 shoe weighing in at 13 oz, it rivals the weight of my Brooks Bedlam. That just isn’t cool! The Brooks Bedlam is a high cushion, maximum stability shoe. Its weight can be justified and viewed as a natural result of the added comfort and motion control mechanisms (guide rails) present in the shoe. The Levitate has none of these benefits. It is a neutral running shoe that is as heavy as a maximum cushion shoe, with the comfort of a speed trainer. Simply put, the shoe needs to weigh less or be more comfortable in order to be a viable option for either speed or distance respectively. As of right now, I don’t see the logic in choosing the Levitate 2 over other shoes that focus specifically on either of those two things. I’m actually really happy with the outsole on the Levitate 2. I have no complaints concerning the performance, as it performs admirably on all terrain and never slips or loses grip even in wet conditions. Accordingly, the responsiveness of the outsole is remarkable. My only gripe is that I wish there was less midsole so that I could really take advantage of this responsiveness and tackle some tricky terrain. Truly, the midsole begs to be tested on tons of different terrain and in many different outdoor conditions. Unfortunately, because of the midsole, I never felt connected enough to the road. The durability of the outsole is also exceptional. The quality of the materials used in the Levitate has always been exceptional. Another thing I love is the design of the outsole. It suggests that it wants you to go fast, with its arrow design almost implying that the shoe is going to propel you forward. It is a shame then that this concept is betrayed by the weight of the shoe. I’ve said it before, I’ll say it again, I love the upper of the Levitate. It is attractive, secure, breathable and durable. Brooks has nailed the design of this upper, and I hope they never change it. The laces are robust but not enough to dig into your foot or feel clunky. The tongue is plush and accommodating. Brooks even nailed the heel collar on this shoe, an addition that in other shoes usually leads to friction and blisters around my heel. Furthermore, the flyknit material does not absorb moisture as readily as the original Levitate did. While the toe-box may seem narrow at first glance, it opens up after a few runs and at around the 50-mile mark, the shoe fits like a glove. It also holds together well, with nothing to indicate that holes will appear any time soon. In the Levitate, I found that the benefits of its responsiveness and snappiness were most noticeable at higher speeds. If you’re going extra fast, you begin to understand what Brooks is going for with the “energy return” concept. The shoe almost propels you forward. This is a wonderful feeling, assuming you’re going fast enough to notice the effect. At slower speeds than a sprint, the shoe feels thick, heavy, and not quite as soft as its weight implies it should be. The shoe feels fine at walking pace as well, but anything between a walk and a sprint is going to feel really underwhelming. I really think that Brooks tried to do too much with this shoe and wish. What I find to be the greatest shame about the Levitate 2 is how good it looks. I love the available colorways, with a new Christmas colorway up on Brooks’ website as of the time of writing this review. Beyond the colorways, however, there exists a shoe that conceptually looks very sleek and modern. The shine of the midsole is attention-grabbing, the design of the upper is inspired and almost cool enough to make me want to wear it with a pair of jeans. And don’t get me started on the Levitate 2 LE. With its ritzy performance suede upper, the thing is gorgeous and makes the sneakerhead in me want to buy a couple of pairs. Well, very obviously, I do not think that the Levitate 2 is worth its price tag. At around 150 dollars, I just can’t recommend it. Truth be told, I’m not sure that I’d be able to recommend this shoe at a deep, deep, sale. There are just too many shoes on the market that do everything the Levitate does much better. There’s even a model that Brooks themselves makes that I find to be superior in just about every single way. The Brooks Ghost 10 is a neutral running shoe that offers excellent comfort, durability and a nice kick of speed. It’s selling for 78 bucks right now on the Brooks website. However, if you’re really “jonesing” for the Levitate experience, you can grab the original for around 120 dollars. Don’t worry about missing out on the new model, as they are practically the same shoe with different colorways. Once again, I find myself wondering when I’m REALLY going to start to feel the effects of energy return in the Levitate line. As of writing this, I’m still not even sure what it’s supposed to feel like really. Is it supposed to feel like a boost of speed? Is it supposed to add to the comfort and ride? Is it supposed to diminish the impact I’m feeling in my joints? I’m still not sure. In fact, I would say that it does a subpar job of doing all these things. Look, I understand that energy return is important, but it isn’t the ONLY important thing in a running shoe. I have logged almost 400 miles in these shoes, and they didn’t come easy. At 6’3” and 185 lbs, I’m a big guy throwing around a lot of weight. Simply put, I need a shoe that’s going to deliver in some capacity. The thing that really upsets me is the realization that if I had spent 150 dollars on these shoes and they performed like this, I would be heartbroken. Furthermore (and I hope I’m wrong on this) I’m really afraid that this whole “energy return” thing is nothing more than a marketing term. I really hope that Brooks figures this one out, and soon. From what I have seen from other reviews, I am not the only tester who has been disappointed by the performance of the shoe. What drives me crazy is that with a few subtle tweaks, Brooks could have delivered an amazing shoe here. I’ll say it till I’m blue in the face, the Levitate line needs to shed the weight and bulk or add to the cushioning. As of right now, I see a shoe that doesn’t stand out in any single way. It is unexceptional. But still, I hope. I really can’t wait to be proven wrong in the future, because I know that there is a better version of the Levitate on the horizon. Unfortunately, I feel like I’ve been running in its underwhelming counterpart, the Meh-vitate. And of the Meh-vitate, I am not a fan. The Brooks Levitate 2 is a shoe built for comfort and cushioning. I found the Levitate to be enjoyable, comfortable, and durable. But by no means does the Levitate come without flaws. My review will focus on the reasons the shoe could work for you (Why? ), what may not work for you (Why Not? ), and some final thoughts (Conclusion). Once again, Brooks puts out a shoe that is true to size. Brooks is consistently one of the most reliable in terms of fit and the Levitate is spot on. The toe box is roomy without being too big. While the mid-foot is just right; not too tight which it strangles your foot but, not to loose causing your foot to slide around. The heel/ankle area almost feels custom fit with the elastic heel collar. The levitate nails the upper. At least, in terms of comfort. The mesh upper is stitchless with a sock liner. The mesh is made of high-quality materials. At the 75 mile mark, I can't find a stitch out of place. The mesh upper is flexible yet supportive. It moves with your foot and not against it. This provides a sock-like feel which I really enjoyed. However, this upper is not perfect. More to come. The levitate is built from high-quality materials. After 75 miles of testing the shoe is holding up great. Minimal wear on the outsole, upper looks pristine, and the foam is just as responsive as it was on day one. This is plain and simply a comfortable shoe. I found my self not only wearing the Levitate as a trainer but, a daily shoe. It was great for walking and daily use. I generally, gravitate towards more lightweight trainers which aren't always comfortable. The Levitate was a welcome change. In a word, this shoe is heavy. The upper is well built and comfortable, but probably overly built. The mid-sole is thick and beefy and the outsole is 95% rubber. All of this adds up to an overly built heavy shoe. My size 11.5 came in at 368g or 13.0 oz. These are one of the heaviest shoes I have ever run in and the heaviest road shoes. Normally, I only come across trail shoes at this weight. This Levitate, in my opinion, lacks range and versatility. It was comfortable and performed well on my easy effort days and through a variety of distances from 5 miles to a half marathon. However, on runs with intervals or speed work, the Levitate didn't work for me. The lack of flexibility and the extra weight really showed its ugly face on these types of workouts. Is the Levitate good for a nice hour jog around town? Yes. Would they be my shoe of choice when looking to PR at my next race? No. The upper on this shoes is comfortable, maybe one of the most comfortable I have ever worn. However, on a hot summer day in Tennessee, my feet were baking and then sloshing around in incredible amounts of sweat. Not only were they overly hot, but they would also take days to dry if I didn't leave them out in the sun. They were so slow at drying that I couldn't wear them on back to back days. 24 hours later they were still soaked. The Levitate list price is $150. I understand the price given the quality of materials. However, there are shoes on the market which can provide the same qualities for $25-50 cheaper. The Levitate is a shoe that is almost comfortable to a fault. The fit was spot on, and the upper felt like my favorite pair of socks. However, all of this comfort comes with added weight, a lack of versatility, and an extremely hot upper. $150 is a steep price for a shoe that doesn't knock your socks off with performance. At that price point, I want a shoe to blow me away. Unfortunately, I just wasn't. It's great for comfort, but I wasn't impressed by much else. The Brooks Levitate 2 is an exciting new offering. Out of the box, the Levitate 2 has a fresh new look – think tie-dye meets astronaut. The upper mesh on my shoes has a neat red-to-blue gradient that is subtle yet good-looking. The DNA AMP midsole is new-age silver, ensuring you’ll be seen as you trot around town. Even on the first run, these shoes were comfortable. The knit upper is seamless and has a sock-like top, conforming to the foot without constraining the foot. The cushioning is comfy and neutral. Overall, this is an impressive lightweight shoe that is ideal for runners looking for neutral road shoes with some cushioning and moderate heel-to-toe drop. I have run 80 miles in these shoes, and they still look new. Again, these shoes were comfortable straight out of the box and have remained so. The knit upper “bootie” hugs the foot and ensures everything stays in place. There is also a tab at the heel that helps prevent blisters from forming. I have wide feet, and the shoe and toebox fit me well (and is true to size). 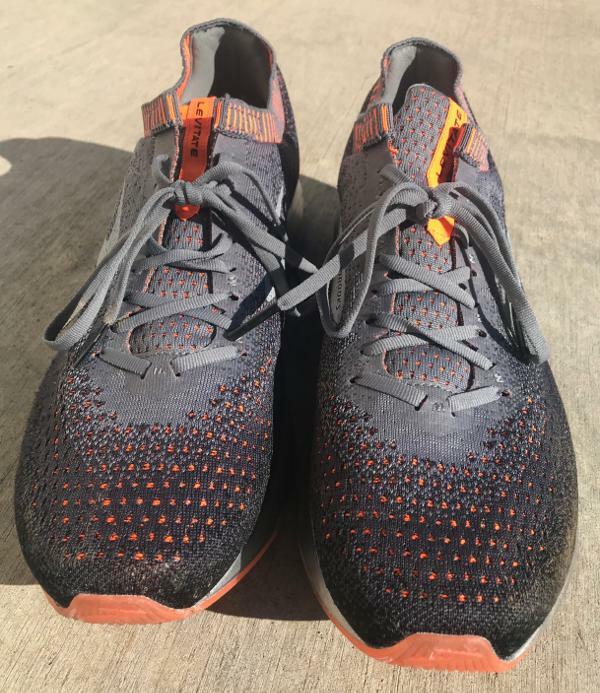 I went for several 10 mile runs in the Levitate 2, and they felt comfortable for the entire run and my feet felt fine afterward. These are well-balanced shoes. The shoes feel bouncy – it feels like you’re hopping down the road in these shoes. Although these shoes are on the heavy side, they feel quite light on runs. This is likely due to Brooks’ special midsole, called DNA AMP, which harnesses and returns energy for each step. It’s not like the shoes feel like jetpacks, but they do feel surprisingly light on-foot given their weight. I have run 80 miles on these shoes, and they are still in great condition with little sign of wear. I’m a larger runner, at 6’3 and 200 lbs. These shoes were great and comfortable for me straight out of the box, even though I’m used to running in low-drop shoes. Although the Levitate 2 feels surprisingly bouncy and light given its weight, it still weighs more than most neutral shoes on the market. RunRepeat states that the Levitate 2 weighs 318 grams, which is 18% more than the average neutral shoe weight of 270 grams. Given that an average person takes about 2000 steps per mile, that extra 48 grams will add up. At $150, this shoe is somewhat expensive. Given the amount of cushion, the feel of the ground was lacking somewhat. Although I like the shoes quite a bit, I found myself reaching for other shoes in my closet after testing these. It likely relates to the weight of the shoes and the amount of cushion (moderate, but more than I prefer). My Levitate 2 has a neat red-to-blue gradient with silver DNA AMP outsole. I quite like the look of the shoes! There are five different colour options, so you’re sure to find one you like. The shoes are also resistant to dirt and remain clean. I was impressed with the Levitate 2 and would recommend them for runners looking for an attractive moderate-drop neutral running shoe. Having run in several cheap pairs of no-name trainers, I have finally decided to invest in two pairs of quality runners, in the hope that they will indeed last longer if alternated. I have done my research. One of them ended up being the Brooks Levitate 2nd edition. The ones with the striking purple and orange color line, with a hint of turquoise. To me, they are way too flash and exceedingly vibrant. But my runner friends seem to adore the looks. They’d be looking at them much more than I would whilst out running especially if I manage to get to the front more. I am aware that many people find the new colors appealing, to me looks are not important. How they feel matters first and foremost. I am one blessed with super-flex joints and a pair of weak ankles, so the main feature aside from comfort that I looked for in the new purchase was stability for my neutral self. The soles of the Levitate 2 (again, silver on their side) are proving to be very stable. The soles widen out enough to provide stable landing and taking off. Along with a very balanced midsole, they provide good support for the wobbly ankles. This feeling is enhanced further with the “soft and stretchy Fit Knit heel collar” and the marvelous flexible laces the shoes come with. I do make good use of the heel lock loop aka “integrated knit eye stay” to prevent the up-down ankle movement. All in all, the aspect that matters to me most receives a massive positive from me. The cushioning throughout is just splendid. The soft heel tab adds to the comfort level and indeed also works well shielding the Achilles from any irritation. The forefoot is comfy enough, as even the toe box (which is average in size) feels amazingly cushioned if a bit too springy. More about this below. I kept the first couple of runs at low mileage to give the runners a chance to break in, but really there was no need to be cautious. The Levitate 2 is so padded and soft, with no stitching that could bother your feet. The upper is nearly one-piece knit material that is lovely and plush. It also greatly contributes to the flexibility of the shoes. I could have easily taken them for a 10k to start with. However, I shall never forget the first run I done in them. I was feeling like a spring bunny, a completely different sensation to my old runners. True to their name, for moments I did feel levitating, the upwards movement more prominent than the forwards. It’s upwards and onwards with these, way too springy compared to what I was used to. They certainly are not a pair of racers nor would I recommend them for getting PBs after PBs. This is also due to their weight; they are a bit on the heavy side. I suppose it’s the price you pay for all those bouncing. Personally, I don’t hugely mind and rather think of the extra muscles I gain during training as a result in itself! The one big downside for me is their slip-resistance or rather the lack of it. Running on a very rainy day those “crystal rubber outsoles” has made me discover that I can still remember how to ice-skate. In addition, the knit uppers find every little raindrop possible and so the shoes get very heavy. It is unfortunate, as mentioned before by others, a very hard-to-dry material, so the runners are out of action for a day or so after a wet run. On the other hand, some 150 miles later they are still springy, bouncy and hug my feet just like as they did on day one. They are extremely durable, so much so, they make me wonder just how many more 150 miles they’ll last for without showing any signs of wear and tear. They deliver each and every run. I have never felt any foot fatigue nor did they cause any pain in my wobbly joints. It’s a joy to look forward to lacing them up and taking them out for a spin – be it shorter or longer distance, they deliver equally well. The Levitate 2 is a good deal even considering the biggish price tag they have, as in return you get a pair of runners that you can rely on and trust to pamper your feet from the very first run and to a very long way. On rainless days, they are my favorite pair of shoes for everyday training. Brooks introduces the second version of the Levitate model, a road-running shoe that delivers ultra-dynamic strides. The flexible structure of the Levitate 2 allows neutral pronators to have a quicker transition phase without sacrificing energy. Same as one of the Brooks popular running shoe, the Glycerin 16, it is ideal for runners looking for a bouncy platform that is not overly soft. The shoe presents an updated upper, which includes a new knit design. It comes with an internal bootie, a knitted heel collar, and a suede-textured heel tab that work together to reduce skin irritation and amplify the comfort. The upper is accompanied by a soft and stretchy Fit Knit wrap that has the capacity to generate a smooth and adaptable ride. The Levitate 2’s outsole retains the layout of the previous version, as it has proven efficient in quick heel-to-toe transitions even as the miles pack on. On top of it is the DNA AMP midsole that capably controls, captures, and returns energy in an active cycle that helps fuel the run. The Brooks Levitate 2 is true to size, as it follows the standard length of running shoes. The shoe has an anatomical foot shape; adequately roomy in the forefoot, while snug and secure in the midfoot and heel. The Brooks Levitate 2 comes in the medium width profile for both the women’s and men’s versions. The outsole of the Brooks Levitate 2 is made from a sticky rubber compound that equips the shoe with durability and traction. It has an arrow-point design that promotes flexibility in movement. A dedicated midfoot transition zone helps the outsole to direct pressure towards the forefoot, allowing for a smoother and quicker heel-to-toe transition. The midsole of the Levitate 2 is comprised of a polyurethane foam encased in a thermoplastic skin – this is called the DNA AMP. This material works by resisting the expansion of the foam outwards, therefore permitting energy back upwards. The DNA AMP midsole enables an energized ride that allows longer distances. Compared to other proprietary midsole materials from the brand, the DNA AMP offers the highest amount of energy return. All the colorways provided by the Brooks Levitate 2 come with a silver DNA AMP midsole for design purposes. An extra layer of underfoot comfort and cushioning is provided by the Levitate 2’s Energize sock liner. Runners have the opportunity to use their custom inserts, as the Energize insole is removable. The Fit Knit upper is considered to be the most significant update in the Levitate 2. The Fit Knit is an ultra-soft material that presents an adaptable foot wrap, coupled with an internal bootie structure that increases the comfort level for the runner. It uses a circular 3D knit that gives a plush feel as it is meant to flex and strategically hold the foot. A modified heel counter in the rearfoot provides a dialed-in fit that aims the reduce irritation in the Achilles region. The faux-suede material it is made from gives it a cushy and protective finish. The low-cut ankle collar is slightly cushioned, to keep the runner supported and comfortable while on the road. The second generation of Brooks Levitate has made a lot of new development which they have picked up from the first generation. The Levitate 2 has made a remarkable change with the shoe’s upper improving the overall fit and feel of the shoe. But what mostly powers the Brooks Levitate 2? Read on for the different types of Brooks technologies that give this shoe the energy it needs. Brooks has developed a smart foam cushioning system which is designed to be completely responsive and deliver the right amount of cushion for all types of runners. The Brooks DNA cushion is engineered with molecules connected in strands that join together to form chains. These chains respond individually to the amount of force the foot receives. It then distributes the pressure thus making the cushioning material last longer. Brooks call these the ‘nanosprings,’ and it does a remarkable job of providing the responsive yet comfortable soft ride experienced with the Levitate 2. This brilliant Brooks technology found in Levitate 2 is all about deflection and energy recycling. The DNA AMP is an even better version of the DNA. Brooks has used their DNA technology and enveloped it in a polyurethane shell making the shoe more responsive by applying the force that the foot receives downwards. This makes the shoe reacts by firming up and distributing the energy back up into the runner’s foot. The DNA AMP is basically the technology behind Levitate 2’s springy feel. It is also responsible for making the shoe lightweight and bouncy during the ride. LE stands for Limited Edition, and like its base version the Levitate 2, this running shoe is packed with DNA AMP cushioning technology for maximum energy return. This limited edition style comes in unique colorways that will serve its purpose for either casual runs or intense training. Released for the festive season, the Levitate 2 Ugly Christmas Sweater Edition has proven itself to not only spread the holiday cheer but it is also as reliable as its base model when used for serious running. The shoe’s special knit upper is laden with red, green and white print pine trees and reindeer. Also completing the cheery look are the two little jingle bells and candy cane striped laces. The Levitate 2’s features kept most of the Levitate 1’s reliable technologies. The only significant change is the fit of the upper. The Levitate 2 now uses a new knit mesh upper. The knit upper makes the shoes fit more snugly throughout the runner’s foot while still being flexible enough to accommodate a wide range of users. The Ghost 11 is often chosen by runners for faster daily training compared to the Levitate 2 because it has plenty of cushioning from the new DNA Loft insert which makes the shoe lighter in weight by over an ounce. The Levitate 2, on the other hand, does the slow and easy runs just fine and because of its maximum cushioning, it also delivers a unique ride. The Brooks Glycerin 16 which is only a tad bit lighter than the Levitate 2, offers a more comfortable ride with the right level of durability, while the shoe’s DNA Loft cushioning wins the new technology in the running feel award. The Levitate 2 is known to be reliable as a running shoe, but the Glycerin 16 outperforms the Levitate 2 especially in the midsole support department. Both shoes are built for long training sessions, but the Levitate 2’s midsole wins in responsiveness as the Clifton 5 tends to be too soft. Although much softer than the Levitate 2, the Clifton 5 is the lighter running shoe when comparing both shoes. The Levitate 2 offers to be far more stable and protective when it comes to cushioning. The Levitate 2 compared to the New Balance 1080 v9 has a much more flexible upper. The 1080 v9’s midsole cushioning comes off too stiff compared to that of the cushioning in the Levitate 2’s and because of the better fit and weight, the majority of runners prefer the Levitate 2 over the 1080 v9 by a short mile difference.